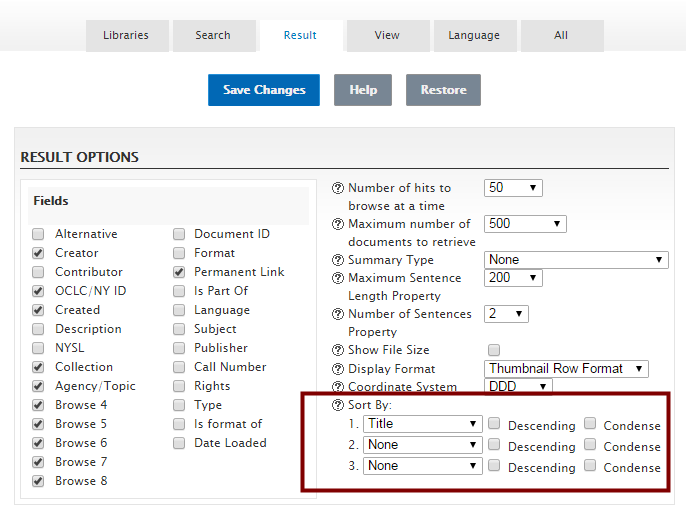 The search box labeled "Search for" performs general keyword searches and retrieves keywords in virtually all of the metadata fields, and in the full-text of the documents. Use this search box to search for words that might appear only in the full-text of the document, rather than in the title or creator fields. Or use this search box if you are unsure where the word might appear. Quotes should be used to search for a specific phrase or name. Wild cards can be used to substitute for unknown letters or to search for multiple similar words. A list of wildcards and their uses can be found by hitting the help button on the main page. A Pattern search (the default) allows you to enter a plain English search with no Boolean operators. This type of search automatically does a pattern expansion on the query words you enter, tolerates spelling differences, and ranks returned documents for relevance. A Concept search allows you to enter a plain English search with no Boolean operators. This type of search automatically does semantic expansion (retrieves synonyms and other related words) on all search words, and ranks documents for relevance. A Boolean search allows you to enter Boolean operators (and, or, not) to assist in finding exact matches for your search words. The Boolean search does not rank results and defaults to "and" if no operator is entered. Use Creator, Title and Agency/Topic to perform a search against a document's metadata. For example if you are looking for a specific document, try typing the title or part of the title in the Title search box and execute the search. . 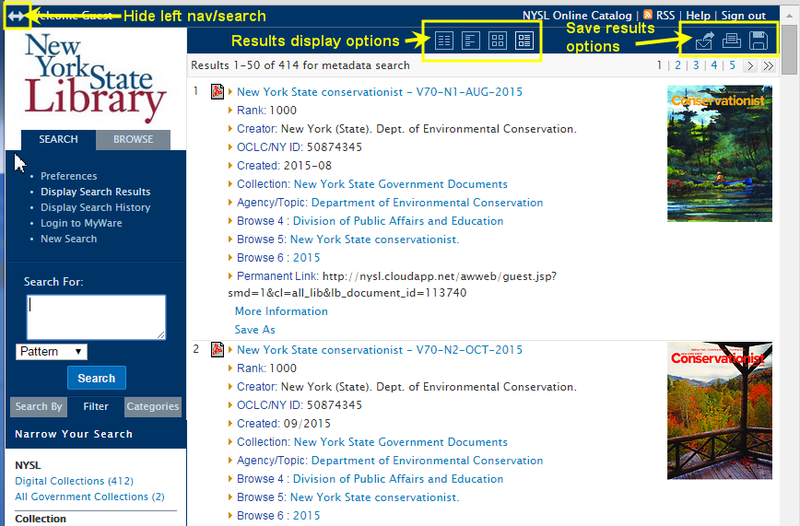 The OCLC/NY ID field is primarily used so we can link our catalog records to our Digital Collections. If you are searching our catalog and find a record that has a link to our Digital Collections, this field will be searched automatically when you click on the link in the Catalog. You can add search fields by clicking on the "Preferences" link in the left navigation bar (see screenshot at left). On the next screen, select "Search" from the tabs across the top. You will then see a list of all the fields that can be searched. If you want to add a field, simply check the box next to that field and click on "save changes." Once you save the change, the fields you checked are immediately added to your search interface on the left. Note: these changes only stay available for your current session. Similarly, you can set preferences that will customize the way your search results are displayed. Click on "Preferences" and then click on the "Results" tab. If you want to add a field to you results display simply put a check mark next to it and click on "save changes." Likewise if you want to remove a field from your results simply uncheck the field and click on "save changes." Additional Results Preferences you can change are shown in the screenshot below. Most notably, you can change the order in which results are sorted. The default sort is by title, but you may find another option, such as Created (date created or published) to be more useful. The Summary Type, Maximum Sentence Length Property, and Number of Sentences Property control whether or not a summary displayed for each document and the type of summary that is displayed. This can be useful if the titles you are searching do not provide a good indication of the contents of the document. After you have executed a search and your results are displayed, there are tools to help you navigate your results. Hide Menu Button: By clicking this button the left-hand navigation Searching Bar is hidden. You can toggle between these formats by clicking on the appropriate icon at the top of the search results screen. Click on the envelope icon to email yourself a list of your search results. Click on the printer icon to print a list of search results. Click on the disk icon to save a list of search results. Results pages. These numbers indicate how many pages or results sets have been returned. Click on a number to advance directly to that page. Browsing from within Search can also be performed from the Search results Page. When you are viewing a list of search results note that the metadata in some of the columns are hyperlinks. By clicking on one of the hyperlinked fields you will jump to that browse folder where you can then browse the other contents of the folder. If at any time you want to return to your list of search results click on "Display Search Results." Search History is accessed by selecting the "Display Search History" button. The Search History window displays a record of all previous searches performed during an ArchivalWare search session. The Search History feature makes it easy to edit and re-execute the query later. The information provided in the Search History screen includes the search string, the number of results returned, and the metadata field searched, if applicable. Searches appear in the order they were performed. To re-execute a search simply click on it and your search results will appear. MyWare is a feature that allows you to set up an individual account in order to receive email notification whenever new documents matching your specific search criteria are added to the system. 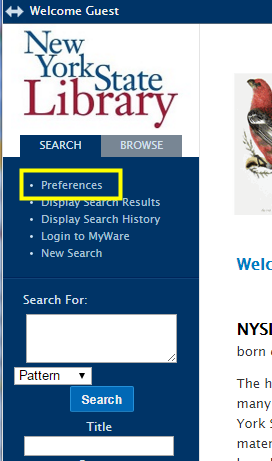 To create a MyWare Account, click on the Myware link underneath the "Search" tab. Click the "Create new account" link and enter the email address you want MyWare notifications to be sent to. Next, enter your name and phone number and create a password for the new account. Once you have an account set up any search saved in the Search History list can be added to your MyWare account. Log in to your account to add searches from the Current Search History section. To add a search, click the box next to the search shown under the Current Search History section and click the Add to Areas of Interest button. Saved searches may be deleted at any time by clicking on the Remove button in Areas of Interest. When a user adds a search to their MyWare Area of Interest, the search is saved as an ArchivalWare RSS query. The RSS query is available to the user as a RSS feed on the MyWare Area of Interest page. Favorite Documents allows you to save documents that you want to review at a later date. First you must create folders that the documents will be saved in. To Add a Folder first log in to your MyWare Account. Then select the "Favorite Documents" tab. At the bottom of the left column click on the button that says New and this will open a box for you to name your folder. For questions about accessing the New York State Documents in the Library's Digital Collections, please e-mail nyslweb@nysed.gov.